Like many ECU football fans, it is hard for me to think of the 1994-97 era without thinking of one particular player who truly epitomizes the never-say-die, against-all-odds mindset that has served the football program so well over the decade of the ‘90s. Tabari "Snoop" Wallace walked his way into Pirate lore by reminding the Pirate faithful that if you want something bad enough and are willing to work hard enough, great things can happen. Along the way, Wallace turned out to be a pretty good football player. So much so that today, the 6-0, 185-pound defensive back is still playing football and still chasing his dream of playing in the National Football League. 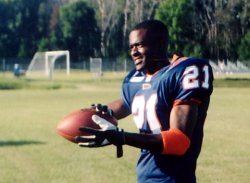 Wallace was an exceptional prep athlete when he roamed the defensive backfield at New Bern High School in the early ‘90s. College coaches were aware of him, but he had a couple factors working against him. First, he was a bit of a feather merchant, tipping the scales in the low 160s, and second, he played with the likes of Brian Simmons, Jeremy McDaniel, and Stacey Whitehead— all Division I recruits and two still playing in the NFL. Wallace made good on his promise to himself, earning a scholarship in his red shirt freshman season. After both Hart twins went down to injury against Central Florida and a trip to the Liberty Bowl hung in the balance, the smallish walk-on “Snoop” Wallace intercepted a pass sent his way, ensuring a win in the closing moments of the game— leaving an instant-lasting impression. The rest, as they say, is history as Wallace went on to earn a starting position his junior year and finished as one of the great stories of Pirate perseverance paying off. Today, Wallace is the same guy, driving toward a new set of goals. He is a little older at 25 and a little wiser with a B.A. in physical rehabilitation and a Master’s degree in the same discipline. He is presently working towards yet another Master’s Degree in Education, and is no less driven to attain his dreams despite the seeming mountain before him. Snoop’s belief in himself took the defensive back on a roller coaster ride of a football career since he last strapped on his Pirate gear. After graduation, he sat through the NFL draft, thinking he might hear his name as a late rounder, but ultimately was disappointed. A phone call did come that day, however, as he signed a free-agent deal with Pittsburgh and headed off, once again, to prove himself. What he learned was more than he ever imagined. It wasn’t long before he was at it again, this time in the Arena League II. Lifelong friend and co-Pirate Whitehead was playing in Peoria, Illinois and called Wallace. Wallace quickly learned that to succeed in AII, you really had to love the game because you weren’t going to make a load of dough. Strong performances in Peoria begat a three-year offer from an expansion club in the Arena League first division with the Houston Thunderbears last year, where the payoff is two-fold. First, the pay is enough to live a little better; second, in the wake of St. Louis Rams quarterback Kurt Warner’s jump to the NFL, the Arena I league has become a picking ground for NFL clubs. In the interim, as he has over the past two seasons during the Arena off season, Wallace is a coach at New Bern High School, serving as defensive backs coach. The coaching means a great deal to Wallace, who takes great joy in watching kids who love the game. Tabari "Snoop" Wallace. Photo by Chris Whitford. “It really reinforces the game in me,” he remarked. “Coaching… it’s great. You look at these kids on Friday night and it just kills me. You see them make a play and you know, ‘there it is, they really got it that time.’ Of course, it also gets at you because you just want to go out there and play. Show them everything you have been trying to teach them. Talking to Wallace, you get the feeling that he wouldn’t know what to do with himself if he weren’t completely busy. To that end, he is in Graduate School, again. He is coaching. And, as always, he is training, training, training— in preparation for another season of Arena I and, somewhere out there, another shot at his dream.